When i first started to learn the fiddle i 'interviewed' a couple of potential teachers. the first that knocked on my door turned up 'bear footed'. In the part of Australia that I live in is not all that unusual. But she then said that she 'forgot' to bring her violin. 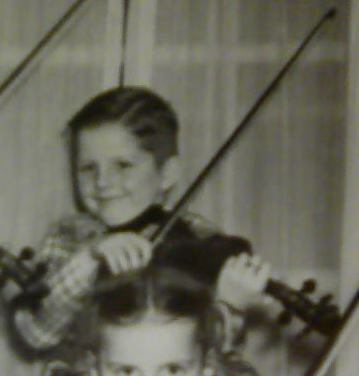 Fortunately at that time I had 2 violins and gave her on to use. He then proceeded to show me how good she was on ' my'' violin. Do you think that she was ever 'employed' as my teacher?? That would be my guess. You can use the Poll feature and see what others think. We're talking about Australia here, very hot. I think new teachers should be willing to audition. That should be a part of the interview, if they can NOT play well then how can they get you to play well? Unfortunately playing well doesnt guarantee that person can also communicate how to duplicate that in the student. Also, not all good teachers play at a high level. For my part at least I am completely upfront and honest with all my students from the get go. They know they arent getting a pro at all. But, the first lesson is free and if we have a good rapport and they feel comfortable proceeding, we usually carry on. I also only take on rank beginners as well. This also translates to the student however, I have met teachers who dont take beginners and any hopefuls must audition for them. What a nerve racking process that must be. Well, I suppose at least part of it still depends on how well she played. Ok, so if you want to consider her one point down on the score for not actually bringing her violin, that's cool, but it doesn't mean she couldn't teach some, or that she was always that unprepared. As Pf points out, someone playing good is no guarantee at all that they can teach well.. But.. I seriously don't believe that a teacher is likely to be able to teach any better than they themselves can play. If the teacher doesn't sound at least partway to where you'd like to be, it would be my belief that they can't help you much, if any at all. So far as the barefooted bit.. Well, some people like a teacher to be kinda formal and some would be more comfortable with a more "hair down" casual style of teacher. Depends on what the student can respect. What's the verdict though Ferret? How do you use the 'poll' feature. The girl that I have teaching me occasionally now is much more professional and is not only a violinist, she is also a 'Fiddle' player. When replying to a post, you will see a new icon called poll. Press on that and follow directions. When done you press create code. The code will look something like this [ sp_show_poll id="1"] I added a space so that it doesn't pull up that poll. Just save the new post with that code in it and then reload your browser to see the poll. I have a hard enough time teaching the one student I do have, let alone three or four or more to add to the confusion. Fair enough Ken. But with that 'one' do you wear your shoes and have your own fiddle? lol, John,, it really doesn't matter if I wear any clothe's at all because that "one" student happen's to be "me". I learned year's ago from one of my first employer's that if I'm telling / teaching someone how to do something that I'd better be sure I was able to give a proper demonstration how it should be done correctly. One doesn't teach school unless they are qualified. And I am "not" just kidding about this. The only problem with that theory Ken is that lot's of people would never learn how to play. I think it is great if you can teach what you know to a person who has never played before. That person can be responsible for his or her own future and seek better help elsewhere but if it's the only source available to them it's a darn good source to have. Granted, I would hope that a teacher would warn there students that they are learning from a very limited source and there are plenty of better sources available. I am such a perpetual noob, I would not presume to "teach" someone how to fiddle. However, I am quite happy to "share" the bits and scraps of knowledge I have haphazardly acquired along the way, which is what I do with my kids when they are inclined to listen. A teacher doesn't have to know everything. I feel they do need to be able to demonstrate that they have some things you want to learn, though. But sometimes one can work with a particular teacher just to get one part of a skill-set, or even a single technique, and it can be worthwhile. Years ago I was playing in a rock/metal band, and there was this kid who'd only been playing for maybe 6 months in one of the new bands. All he did was rhythm, but.. He as faster than me. Only been playing 6 months and I'd been playing for years, but his 6 months had been learning to play speedmetal/thrash. So a teacher doesn't have to know everything, just some stuff you want. So far as "qualified"? Well, I don't know what the qualifications would be other than "knows how to do some stuff I don't know yet but want to know". I don't know as I'd have any real idea how to tell if someone was qualified to teach some useful music or not. When you've learned what one teacher can teach you, you look for the next one. Learning music and how to play is something I think of as an ongoing process, without end. There's new tricks and sounds being developed every day, and new music being written. That's part of what makes it fun!